There is no better comfort food for me than homecooked Chinese food. Period. I grew up in a family that ate a fusion of Cantonese and Shanghainese cuisine – two very different styles of Chinese food that together offered just the right amount of variety in my home. The sweet and savory red-braised style of cooking popular in Shanghainese cuisine is easily balanced by the light and fresh food Canton is so well-known for. It’s been a while since I’ve posted about Chinese food, so to help ease the current stress of having to study for my national medical licensing exam coming up in 2 weeks, it’s time to share with you one of my favorites. 1. Mix together the light and dark soy sauce, the oyster sauce, rice wine, cornstarch, and black pepper in a large bowl, stirring to dissolve the cornstarch. Rinse off your wings and add them to the marinade, giving them a good toss to coat everything. 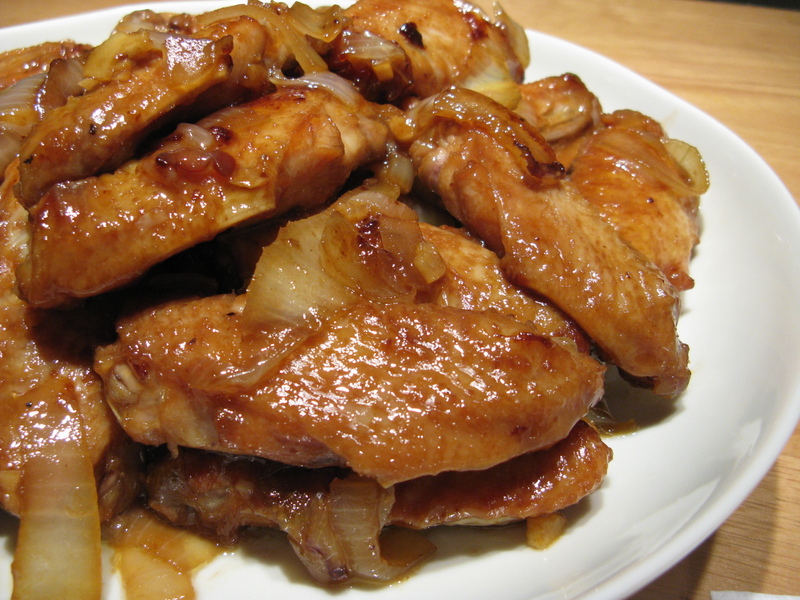 Let wings marinate at room temperature for 30 minutes, mixing occasionally. 2. Saute sliced onions and garlic in a pan over medium heat with 1/2 tbsp of vegetable oil, until they are soft. Remove from pan and set aside. 3. When wings are done marinating, add enough oil to just barely cover the bottom of your skillet and allow to heat up. Gently lay out enough chicken wings to cover the skillet (I was able to fit about 8-10 each time), and be careful because they will inevitably cause the oil to splatter while they pan-fry. Flip them after a few minutes, and pan-fry the other side, until both sides are nicely golden. Set the batch aside and continue to pan-fry the rest of your wings. 4. When all the wings have been pan-fried, add them all back into the skillet along with the onions and garlic. Pour in any leftover marinade that you might have. Cover pan and allow to cook for an additional 10 minutes, until the juices run clear when you pierce the wing meat. 5. Turn down the heat and drizzle honey on top of the wings, tossing well to coat evenly. Taste and adjust sweetness as necessary. Serve with rice and enjoy! 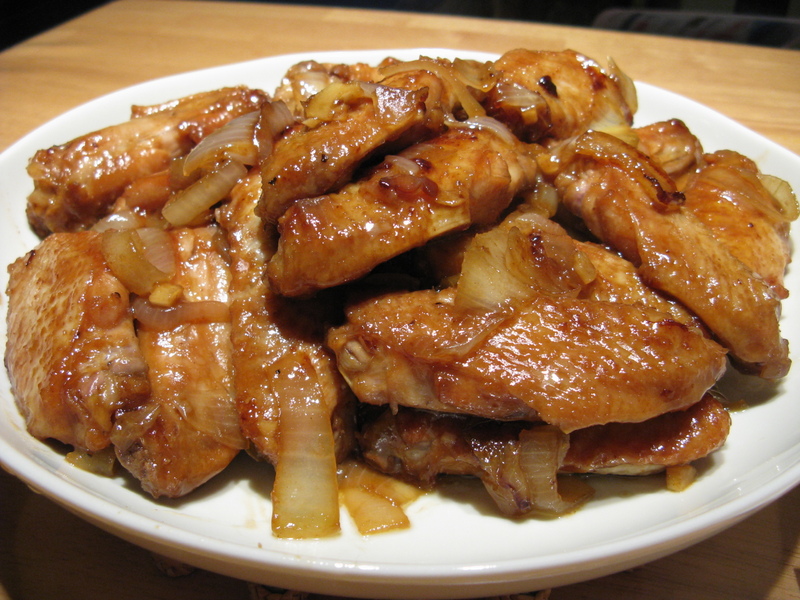 This entry was posted on Saturday, May 29th, 2010 at 4:22 pm	and posted in Chinese, main dish, poultry, recipes. You can follow any responses to this entry through the RSS 2.0 feed. Just as a heads up NEVER pour in unused marinade that is used to marinade raw chicken.